“Paper Louise Tiny Fishman Rock” at Institute of Contemporary Art. Exploring this exhibition meant looking at paintings done on carpet samples. Abstractions developed in response to a staple on a rusted metal surface or scrap. Tiny sculptures dotting white shelves, covered in pigment or plaster, carefully held together by wire. There were some large abstract paintings on the wall, too, a presentation that is more common and familiar for this mode of working. But there were tiny paintings also, barely the size of a few postage stamps, with pieces of canvas missing. Or display tables that were literally covered in piles of smaller paintings, and long accordion books, with grids carefully drawn in pencil. Size can create competition in some shows, larger works demanding more attention than small, but these more typical relationships were somehow absent from this show. Holes were drilled into the sides of display armatures, perfectly framing a small Fishman sculpture covered in paint, encouraging the viewer to look. You did not get the sense that you were supposed to spend less time looking at the smaller things. Bright colors in swatches, aggressive paint strokes in bursts, on every surface, everything both quiet and loud at the same time, somehow. There was much emphasis on process in this show. The display was with littered with studio objects, wooden stools and sculptures meant to inspire, a clear impulse to swirl paint on any available surface or scrap. Again the more predictable hierarchies collapse. 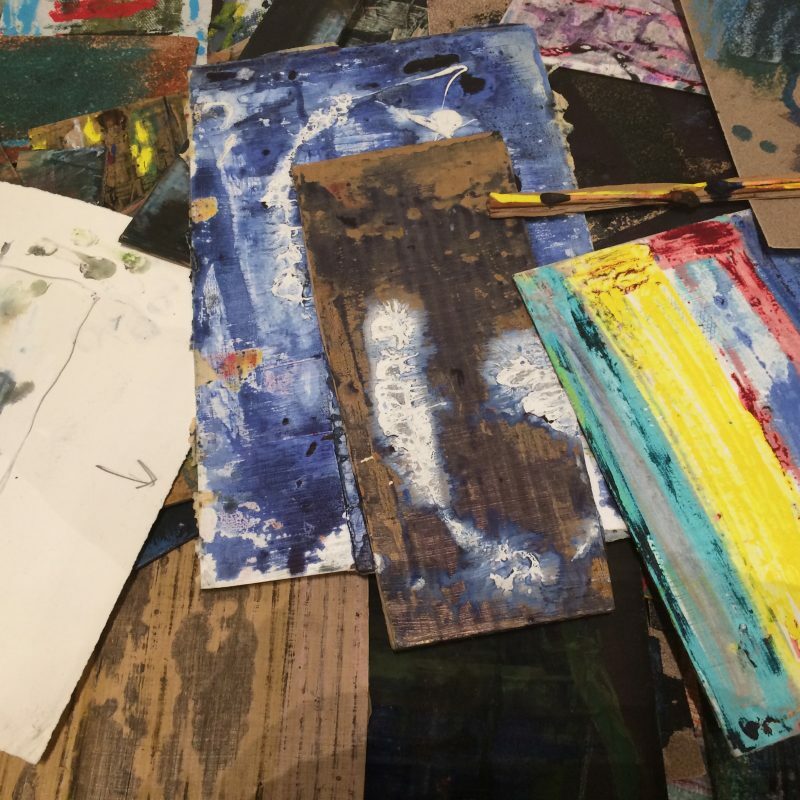 Cardboard and ancient carpet samples are in no way less important than paper or canvas. All are armatures, holding paint and pigment at different angles, brush strokes wide and small. Objects and surfaces growing out of the space from which they are made, refusing to dismiss small bits of cardboard as garbage, inviting them into the language of abstraction, commanding attention always. It’s subversive, you realize. The texts accompanying the show confirm it. Fishman’s voice developed within an art world dominated by males, her command of paint as a medium growing in a context where scale, material, and abstraction as a language had already been assigned a gender. In interviews with the show’s curator, she speaks of her relationship to what had been deemed at that time as “women’s work,” her involvement with the fight for gay rights, and the project of feminism. The contemporary art world benefits from more collapsed boundaries, media that are somewhat freed from these overtly gendered boundaries, and woman artists and abstractionists like Fishman were an important part of this eventual transition. Which is why you go around again, spending more time with the small things and the larger ones, materials both stubborn and fragile, humble and massive. The hand that is so present in her paper books, in places held together by staples, dabbed in watercolor, fluid pigment navigating around fragile grids. You stand in front of large canvases with dark colors scrubbed into the surface, studying the spiky brush strokes, radiating energy. A show revealing a space that was carved out of history long ago, with sets of tension still on display, continuing to move. Bridget A. Purcell is a visual artist who lives and works in Philadelphia. She obtained degrees in creative studies from Tyler School of Art and Washington University in St. Louis, and her art work has been shown in Philadelphia, St. Louis, and Rome, Italy.